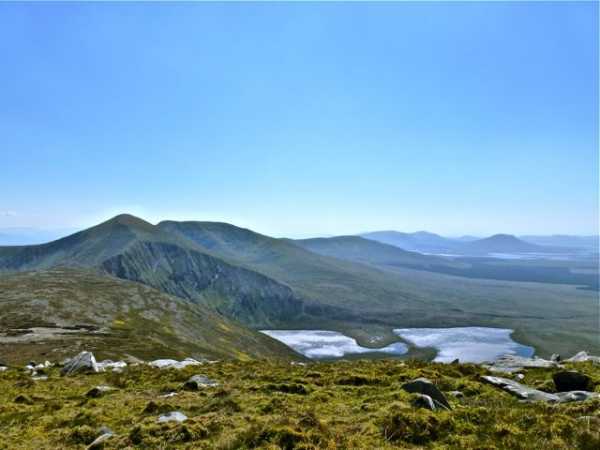 Nephin Begs - a serious hiking challenge! Another of those peaks with an alluring name! 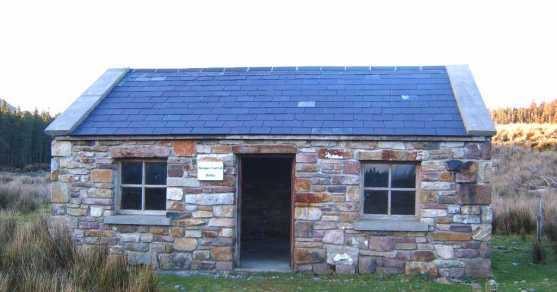 Started the hike at the carpark at F 968 056 A beside the Brogan Carroll Bothy shown in gerrym's photo, followed the Bangor Trail to the bridge crossing the river at F 948 065 B before heading roughly in a straight line to the spot height 384 on the ridge which curves towards Glennamong. The final climb from just west of Glennamong East top (spot height 415) to Glennamong itself is initially steep before levelling off. The highest point is not at the cairn but a little further north. We continued to take in Nephin Beg; 3 OS maps were actually required for this hike! Our descent to the Bangor Trail followed the broad ridge running roughly NE; we took a line towards the little lake just south of spot height 256. 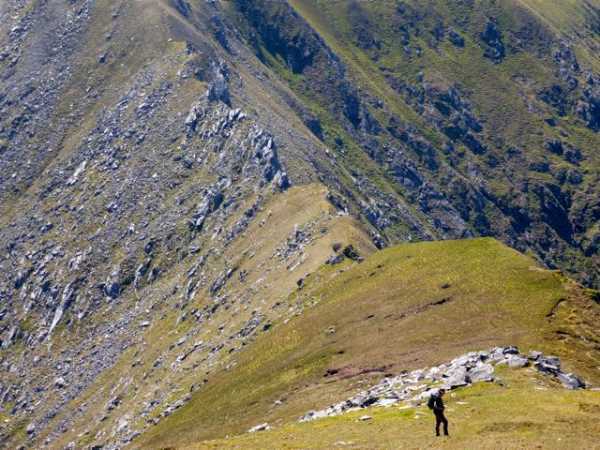 Care should be taken of the steep gradients to the left in poor visibility. 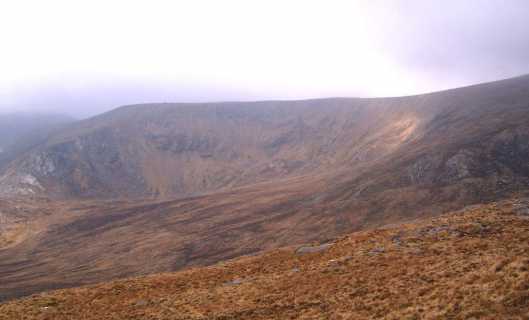 The loss in height is considerable (470m approx), all of which needed to be regained as Nephin Beg and Glennamong have virtually the same elevation. Glennamong forms the northerly summit of a horseshoe walk starting from NW of Lough Feagh. From it there are fine views in many directions. 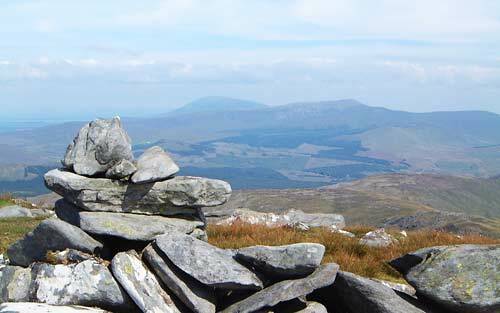 This picture shows Nephin on the skyline to the right of the cairn. 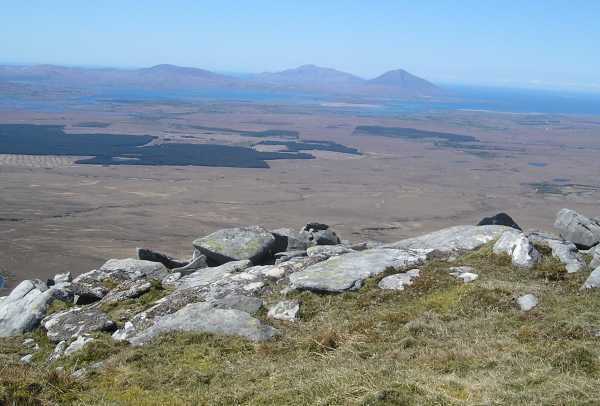 To the right again is Birreencorragh, a convoluted mountain with a long central north south ridge and various smaller ridges leading off to West (Mount Eagle) and East (Knockaffertagh). Viewed from Glennamong, which is to its west, the profile of the central NS ridge is well displayed. Only just visible in the small version of this picture is Lough Conn, some 25k away.